More than half a million Spanish families are living in homes worth less than their mortgage, after house prices crashed by 50pc. 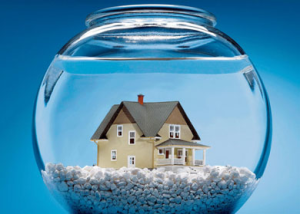 A study of “bubble mortgages” in Spain by Kelisto.es, a financial products comparison website, finds there were 581,441 mortgages under water in 2013. They forecast the number will rise to 668,940 this year, and 710,386 in 2015, a rise of more than 20pc in two years. Households in Spain have been driven into negative equity by a massive crash in house prices, which have fallen around 50pc since the bubble burst in 2007. Spanish households are sitting on balance sheet losses to the tune of 13 billion Euros as a consequence. Most of those families are financially trapped in their homes, unable to sell without realising huge losses they can’t afford. This reduced labour mobility, which is more bad news for the economy. The number of underwater Spanish mortgages exploded 850pc in 2011, from 14,333 to 135,792, say Kelisto, and the proportion went from 0.3pc of of all mortgages in 2009 to 9.5pc at the end of 2013, forecast to rise to 11.3pc in 2015. It took a while for negative equity to kick in, given that the crisis started in 2007. The average value of negative equity in 2013 was €22,216 in 2013, expected to rise to €25,000 in 2014, and €27,500 in 2015. Based on an average house price of €150,787 in 2013, the average of loan-to-value of borrowers in negative equity was 115%, forecast to rise to 118pc in 2014, and 122pc in 2015. Catalonia and Madrid, where house prices have fallen 47pc and 43pc respectively, are the areas with the biggest problem of negative equity. These two regions are home to 42pc of all underwater mortgages, 24pc of them in Catalonia and 18pc in Madrid. Foreclosures are the most visible tragedy of this crisis, but families trapped by negative equity are the unsung victims of the housing bust, say Kelisto. “These bubble mortgages have trapped thousands of families all over Spain without any chance of selling their homes and paying off their debts if they need to, and knowing that they will have to continue paying a loan much bigger than the value of their own home,” says Estefania González, head of personal finance at Kelisto.es.